Can a Russian Silicon Valley Spur Tech Innovation? Russia's opposition has long been fond of the word de-Putinization, which to those who dream of such things is a different way of saying "progress." It reflects the rather starry-eyed belief that if Prime Minister Vladimir Putin and his circle fall from grace, change will come immediately and Russia will morph into Europe. For years, the opposition movement's strategy has been to rub away at Putin's credibility "like drops of water on a cinderblock," as one of its leading figures, Boris Nemtsov, puts it. For most of that time, the impact of their work has fit this analogy. In the past few weeks, though, signs of something new have begun to emerge. Regular Russians, not just the usual crew of activists, have been coming out by the thousands to call for Putin to resign. De-Putinization, opposition figures say, has finally begun. The pivotal point came on Jan. 30, when an opposition rally in the western city of Kaliningrad attracted 10,000 people, an incredibly high turnout for Russia's docile political culture and likely the biggest protest in at least five years. The people in Kaliningrad have a lot to be angry about. A hike in import duties has crushed one of the region's most vital industries: imports of used cars from Europe that are then sold in Russia. The end of that trade has put as many as 20,000 locals out of work. The price of utilities has jumped. On top of that, the unpopular governor, a Kremlin-appointed former tax minister from Moscow named Georgy Boos, levied a new tax on drivers. During the worst bout of unemployment and economic decline in a decade, reports of Boos' lavish vacations to Europe have made many locals despise him. For the opposition, this presents a great opportunity. Opposition leaders flew down from Moscow to have their turn at the podium during the late-January protest. Alongside local activists, they called not only for lower taxes, more jobs and a new governor but for an end to Putin's reign. Nemtsov was the most prominent figure to speak. A popular governor of Nizhny Novgorod in the 1990s and a Deputy Prime Minister under President Boris Yeltsin, he took the stage in a bomber jacket and jeans. "Moscow is sucking the money from the regions as if they were its colonies," he said. "Until we oust this corrupt police state, we will never achieve a thing." There was a swell of applause, and he finished his speech with a famous quote from Alexander Pushkin, the nation's greatest poet. " 'Russia will waken from its slumber,' " he shouted. " 'And on the ruins of despotism, our names shall be inscribed!' " The crowd went wild. The government became the enemy. A few weeks later, at his office in a Stalin-era high-rise in Moscow, Nemtsov is still beaming. A new strategy had come out of Kaliningrad, he says, and he seems restless to enact it. "We have to monitor the overall environment very carefully. We have to spot where protests are flaring up, and we have to act on that," he tells TIME. "At first it will be a mosaic. It will be fragmented ... But eventually the whole country will catch on." The ultimate goal, Nemtsov says, is to organize a rally 10 times the size of Kaliningrad's in the center of the capital. And then what? "Well, after that, we'll have elections, and then we'll see who wins and who loses. But the point is, we have to get rid of Putin. He is dangerous," Nemtsov says. "I think this year is going to be the year of anti-Putin protests." He may be right. Demonstrations have cropped up around the country in the past few weeks. They have been smaller than the one in Kaliningrad but still very large by Russian standards. In the Siberian city of Irkutsk, a protest on Feb. 13 attracted about 2,000 people. In late 2008, just as the Russian economy was plunging, there was a protest of a few thousand people in Vladivostok and subsequent rallies that brought out a few hundred people. But the latest rallies are larger, the reasons behind them more diverse and the calls for Putin's resignation more fervent. The Prime Minister's popularity has started to suffer. In the week after Kaliningrad, Putin's approval ratings, as measured by state-run pollster VTsIOM, fell to their lowest level in almost four years. He remains, of course, the most popular politician in Russia by far, as well as the most powerful. But even the mainstream opposition sees an opening. Take the Yabloko Party. It had led the pro-Western forces in parliament throughout the 1990s before being voted out in 2007 in an election it says was rigged. Kaliningrad has helped turn its focus to the streets. "The outlying regions are in a better mood for protests," its leader, Sergei Mitrokhin, tells TIME. "Kaliningrad shed light on all the vices of the current regime and its economic policies, and it has led us to activate our regional branches. We have been carrying out a series of protests and pickets around the country, and we will continue working in this direction." The hurdles are many. 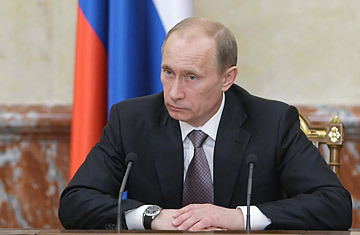 Putin loyalists control Russia's political institutions as well as the entire bureaucracy. The government controls all the major TV channels. The Kaliningrad protest got virtually no coverage in the mainstream Russian press. Putin has also been able to deflect part of the resentment by dressing down his political party, United Russia, and sending out envoys to show that the Kremlin is paying attention. Meanwhile, the opposition remains deeply divided. Egos sometimes override pragmatism, and a real alliance appears unthinkable. Since Kaliningrad, opposition leaders have gone back to denouncing one another. "There is a fear of competition between them," says Valeriya Novodvorskaya, a prominent Soviet dissident and a vocal critic of Putin's rule. First arrested by the KGB for her activism in 1969, Novodvorskaya is no stranger to the opposition, but she is wary of the latest flare-up in public resentment. "A street protest is not a grocery store," she says. "You go there to demand your freedom, not to ask for more sausage on your plate." If the recent demonstrations topple the government, Novodvorskaya says, most likely the communists or some other authoritarian force will seize power. Such parties are best placed, she says, to promise handouts and paternalism, the things people want at a time of financial crisis. "We've played that bloody game with the Bolsheviks before, and the motives behind these protests are again material. These people don't want to hear about free-market capitalism and European integration. These are foreign notions here, and they will support anyone still capable of throwing them a bone. Don't be confused. The government still has bones to throw." Kaliningrad's transport tax, for instance, has been called off for this year, and Russia can afford it: the state is still reaping massive profits from its sales of oil and gas. The broader economy is also recovering, and even though Putin's initial reaction to the protests showed some signs of dismay, Mitrokhin is far from certain that the government is afraid. "It amazes me," he says. "People are screaming for him to get out, but there is no sense that he is trying to reform or justify himself. He feels his own strength. If needed, he knows he can rig the next elections or carry out such a massive p.r. campaign that the people will love him again ... It's naive to think he will cave."